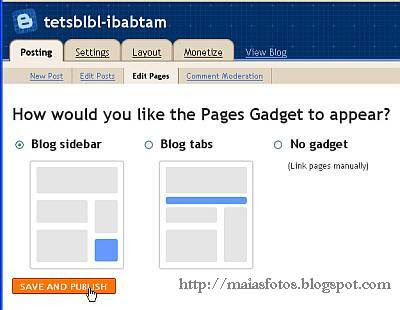 Blogger introduced the new static pages, the most requested feature by many blogger. 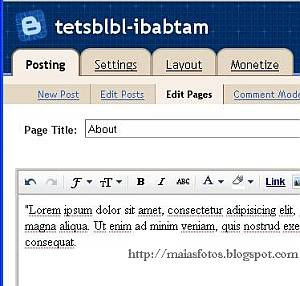 Creating static pages in Blogger is a new feature for everyone, opening many possibilities for new tricks and much fun. We have the possibility to create 20 static pages for each blog. Well, it is not exactly what we expected; a Blogger static page looks like any other post page, on the first glance. There are some notable differences though between a post page and a static page. With some extra styling an customization, we can use these pages as stand alone About page, Contact page, gallery page, table of content page, you name it. These tutorials are the result of testing the new static pages feature on my test blog. Being a beginner blogger myself, with limited experience, I decided to share my results with those interested. Let's create our first static page and we'll talk about customization and tricks later. Creating the first static page. - Go to Dashboard |Edit posts and click on the Edit pages tab. - Click on Create a page, if this is your first page. Edit your content and give the page a title. Enable or disable comments in post options, they are disabled by default. This feature is not available any more in this old interface but you can access it from the new editor. Read the updated version by clicking this link. When you are ready hit Publish page. This new window at the right pops up with three possible options to publish your new page. Don't worry about choosing the right option, it can be changed by republishing the page. Find out the difference between the three options in my next tutorial. 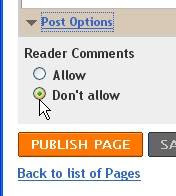 Hide all widgets on Blogger pages-create a simple page New! I tried following your instructions in draft mode and they did not work. I see your update says it works in the usual blogger. I can't get it to work at all! You have any new info? Thanks. Nevermind - missed that these pages are static. It's a shame, would be nice to separate post types onto pages. Actually, this page here is a post page not a static page but it's customized individually. It would be nice to have different post page types indeed. My sitemap (TOC) is a simple, handmade list. I update it manually once in a while. It's much work, you probably don't want that. 1. Sign up or activate your Webmaster Tool account(Go ogle and Yahoo/Bing) and submit your RSS/Atom feed as a sitemap. 2. For a simple list you can find all your post URLs in your archive. You are welcome เจ อยุธยาป่าก๋อย. The reason why I'm using a handmade list is because this way I can have two columns of links instead of a long, narrow list, filling more space on the page.